Doncaster Rovers’ unbeaten home record was smashed by Joey Barton’s robust Fleetwood Town side. Town, without a win in six, did not give an inch against Rovers and ran out comfortable winners on a miserable afternoon at the Keepmoat Stadium. 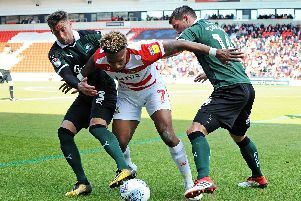 Doncaster were their own worst enemies as they gave away a fourth minute penalty, missed a number of good chances and conceded from two corners to trail by three at the break. The second half was a non-event after a mistake by Joe Wright allowed to Ashley Hunter to score a fourth. Rovers finished the game with ten men after Andy Butler went off holding his collar bone. The game got off to a bad start when Ched Evans was clumsily brought down in the box by Marko Marosi and got up to slam home the resultant penalty. But much worse was to follow. Barton's side stopped Rovers playing and stood up for themselves physically. However, prior to Wallace heading home Fleetwood's second from Hunter's 34th minute corner, the home side ought to have been level. Mallik Wilks saw a powerful shot kept out by Doncaster-born Alex Cairns in Town's goal and Wright headed Niall Mason's cross inches wide. John Marquis had 45 minutes to forget, first heading wide from six yards out. With his side trailing 2-0 he wastefully lobbed straight into Cairns' hands after being sent clear. The striker's afternoon then went from bad to worse when he skied a sitter from point blank range - and within seconds Ashley Eastham extended Town's lead by heading in Ross Wallace's corner. Any hopes of a comeback were dashed just four minutes after the re-start when Wright was robbed by Hunter who gleefully ran clear and slotted past Marosi. Marquis saw a close range effort blocked and Alfie May’s late shot was tipped wide by Cairns but there was little else to write home about as Rovers slid to their second defeat in five days. Rovers: Marosi, Mason (Crawford 53), Wright, Butler, Andrew, Whiteman, Blair, Kane, Coppinger (May 60), Wilks (Beestin 73), Marquis. Subs not used: Lawlor, T Anderson, J Anderson, Amos. Fleetwood: Cairns, Coyle, Eastham, Sheron, Husband (Holt 9), R Wallace, J Wallace (Morgan 46), Taylor, Hunter, Evans (Burns 70), Madden. Subs not used: Crellin, Dempsey, Long, Biggins.